If you missed Part 1 of the OKCMQG's travels to Budapest, see it HERE. As you'll recall in Part 1, the workshop participants were reluctant to use their MODA Fabrics mini-charm packs provided. So, we challenged these ladies to use their charm packs to make a mini-quilt to be judged by a few the OKCMQG members. The top quilts would then make the trip back to Oklahoma with Agnes and be featured as part of our display at the Oklahoma City Winter Quilt Show. Being on the jury, I can say that it was difficult to choose a winner. We loved all of the projects! I'm happy to show you the winning projects and introduce you to the creative women who have inspired us all. I'll start with our 1st Place winner and then list the others in no particular order. Edit learned the basics of sewing, knitting, embroidery and crochet from her mother. She started by making clothing, home decor and toys. She used quilting in her work even back when she had no idea quilting was a whole craft in itself. Her first formal experience in patchworking was through a book someone had loaned her. From that point on, she tried to learn how to quilt on her own. 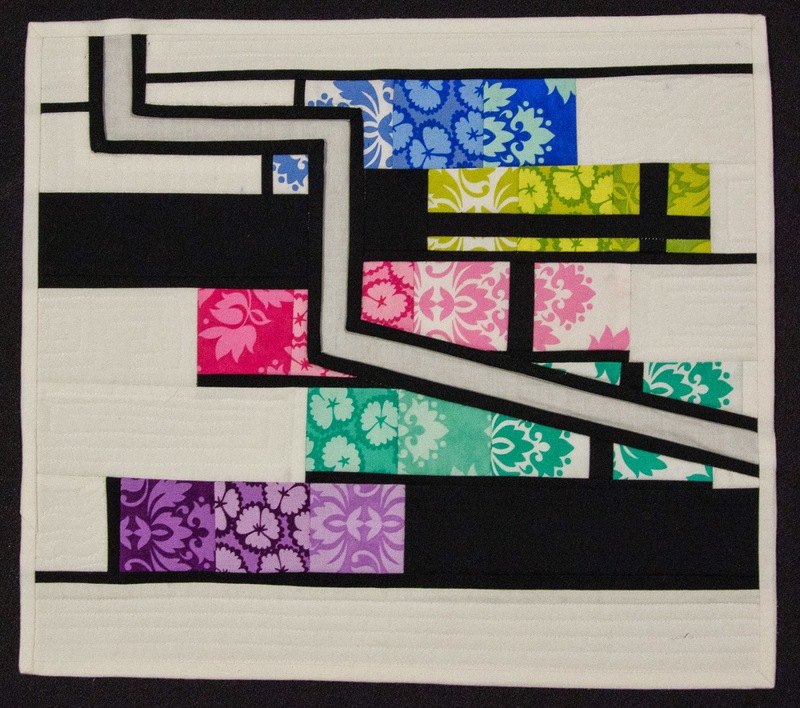 In 1997, Edit joined a group of enthusiastic beginner quilters. They learned the ropes together and have stuck it out with basically the same members to this day. In the Spring of 1998, they became formal members of the Hungarian Quilt Guild - under the auspices of its founder, Anna Dolányi. Their chapter has continued to learn new skills. They have sew days almost every week and prepare projects that are entered in national and international quilt competitions. 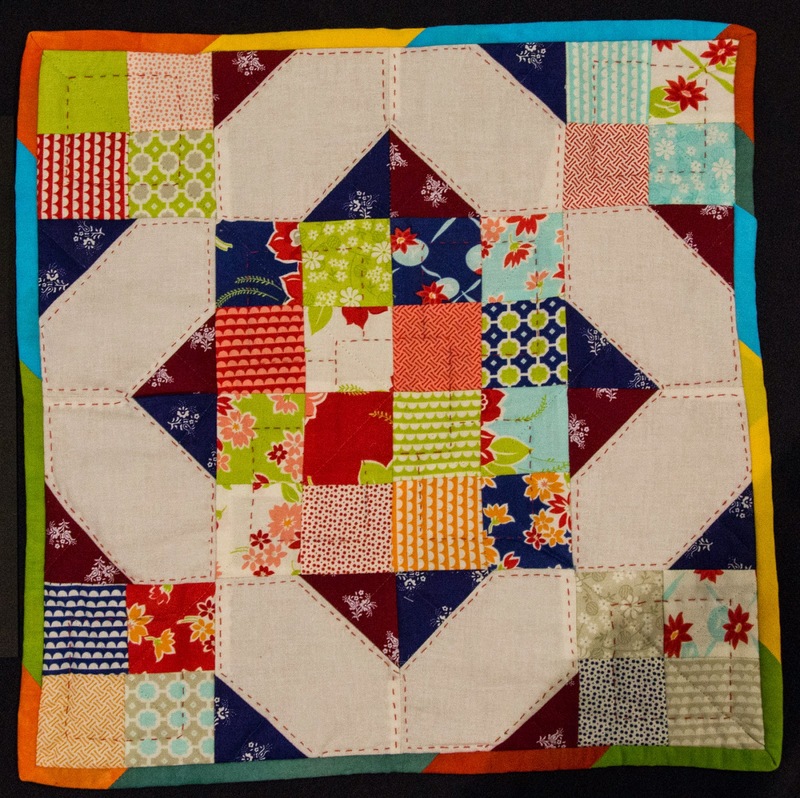 Edit has also sent her individual quilts to be entered and exhibited in various patchwork competitions. More recently, in 2014, she was part of a major Guild project: they stitched up a huge 3-dimensional installation to represent a Hungarian tiled stove, with each tile prepared in French "boutis" embroidery. 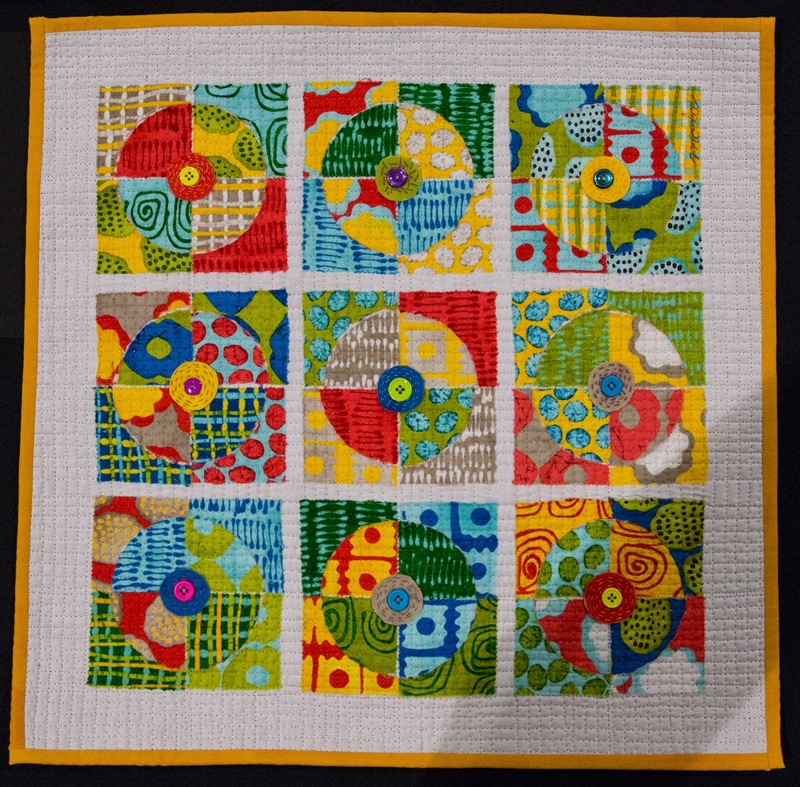 This was exhibited at the 2014 Houston International Quilt Festival. Several of Edit's art quilts have hung in exhibitions in Germany, France, The Netherlands, Bulgaria, and now in the USA. Melinda is originally from Brassó, a city in the Hungarian part of Transylvania. Her degree is in mechanical engineering and she has lived in Hungary (the town of Dunakeszi) since 1990. She has a 24 year-old daughter, named Blanka, and they are very proud of her. Melinda as enjoyed doing crafts from when she was a kid and still remembers taking her lunch to school in a bag she crocheted when she was 7. She learned to knit and cross-stitch from her mother, and her mother-in-law taught her the Hungarian style embroidery. Up until about 5 years ago, when Melinda fell in love with quilting, she mainly did knitting and embroidery. Although she had some previous sewing experience, at first Melinda did not follow the rules of stitching three layers together. Currently, she feels inspired by the work of Jude Hill (of Spirit Cloth), embroidery artist Karen Ruane, and quilter Judy Martin. Modern quilting is another source of inspiration. Melinda is grateful that her family fully supports her hobby and she's excited about developing her quilting skills and always learning something new to include in her work. Marianna's degree is in engineering, but she worked in government administration and foreign trade until her retirement in 2006. She has two sons and two grand-babies. She has travelled a lot (mainly in the countries of the former Soviet block), and speaks fluent Russian, Polish and German. Her job was very demanding, so she turned to creativity and crafts in her free time. Marianna first got acquainted with quilting in the 1990s. At the time, there was very little literature available on quilting in Hungary. She mainly taught herself from American quilting magazines she found in second-hand bookstores. 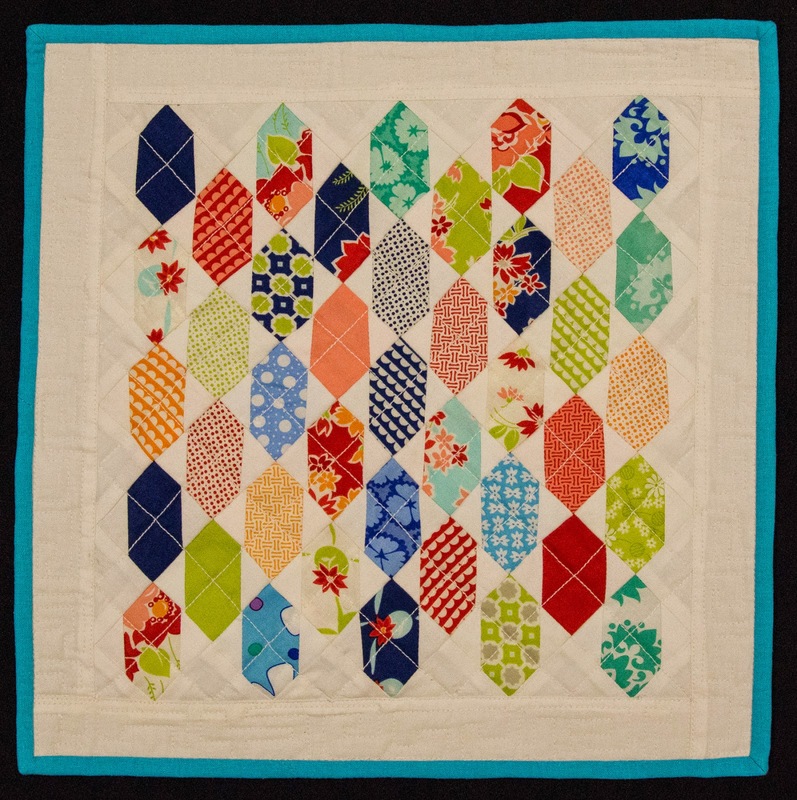 Initially, Marianna thought that everything in quilting was English paper pieced, so she drafted her own patterns and used her old dresses and some cotton fabric available in stores. The best fabric shops at the time (in the Eastern block countries) were in the German Democratic Republic, and interestingly, in Moscow. Most of what she made then, is still UFO somewhere deep in the back drawers of her closet. Quilting really took off in Hungary during the early 1990s. Melinda became a member of the Hungarian Quilt Guild in 1997, which helped her to get better acquainted with different patchwork techniques. The arrival of the Internet opened up the quilting world to her and many other quilting enthusiasts in Hungary. She also purchased a good machine, and now has a permanent place for it. Marianna was voted to the Board of the Hungarian Quilt Guild, and has served there from 2009 to 2012. Once Hungary became a member of the EU, quilters could travel more freely to Germany, France and England to frequent their quilting stores or enter quilting competitions. Local quilting groups also multiplied and Marianna founded and still leads a small group in Budapest where they ever strive to learn new things. Although Marianna works in a variety of styles, her favorite technique is still English paper piecing. Annamária started to learn the basics of patchworking a few years ago and was hooked from the first moment. The more she quilts, the less she knows...or at least that's how she feels. 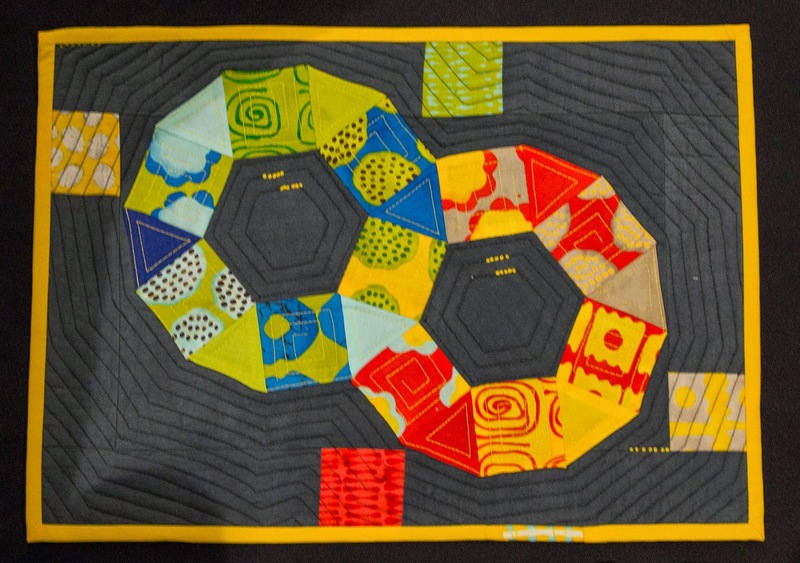 Annamária's luck seemed to change when someone who had signed up for the Modern Quilting workshop organized by the OKCMQG in Budapest had to cancel. She was first alternate and got in! 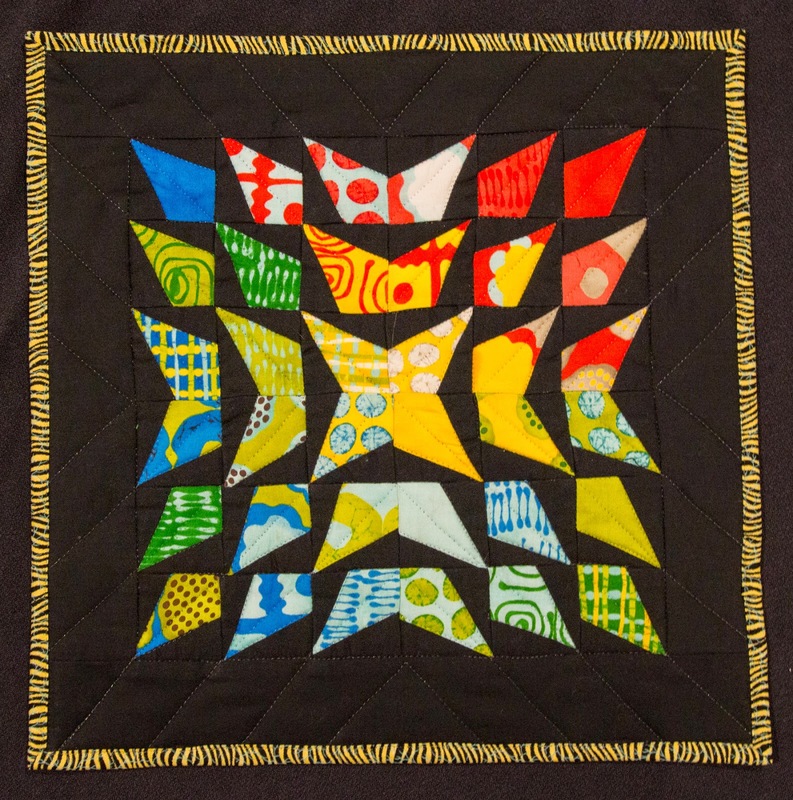 Annamária was amazed at the modern quilts and a new window of opportunity opened for her! She was so glad to be a part of it all, glad for the information on modern quilting, and glad to receive the door prize fabric. Annamária felt that she HAD to reciprocate with a modern project, so she entered the challenge. 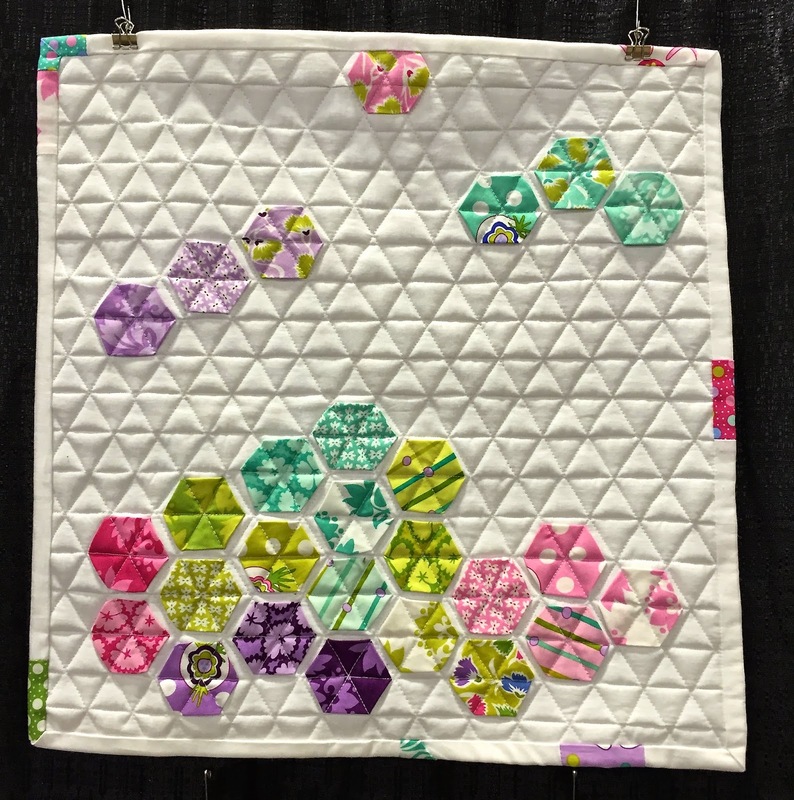 Her next lucky break came when her "Hexi-Tetris" mini quilt was chosen by the jurors to represent Hungarian quilting in Oklahoma City! Mónika teaches German in a Kecskemét high school and trade school. She started sewing in 1996, and her first machine was an old mechanical Singer sewing machine. She even quilted her first project on that machine. Mónika is new to quilting, just starting the past Fall. Both modern and traditional quilting appeals to her. She likes the idea of challenging herself to do new things. This is Mónika 's very first project to be shown to the public! Évi has been quilting since 2002, and while, at first, she was drawn toward traditional blocks, she later found herself attracted to art quilts and free-style sewing. Being more of a process quilter, Évi always enjoys finding new techniques and coming up with new tricks more than the actual end result. Her degree is in apparel engineering and design, so she is attracted to machines and technology. Her other hobby is fabric dyeing and she combines the two by using her own dyed fabrics in her quilts. 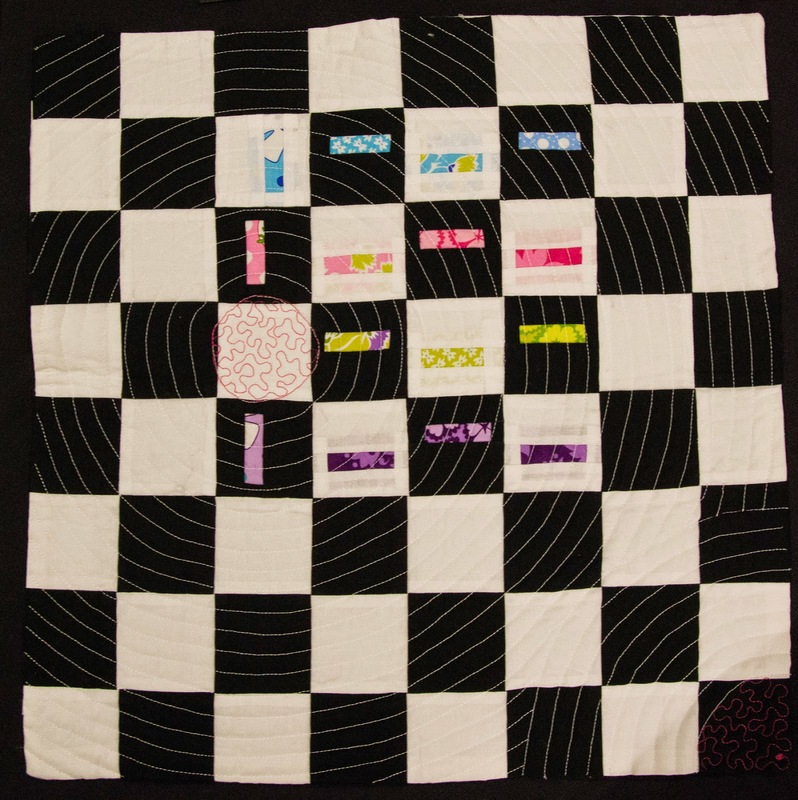 Évi's first encounter with modern quilting was at a 2012 quilt camp. She instantly got hooked and made her first modern quilt there. One year later, the Hungarian Quilt Guild (Magyar Foltvarró Céh) made modern quilting into a separate category for its annual quit contest. That was the first time she ever entered a country-wide competition, and Évi's quilt took 3rd place! 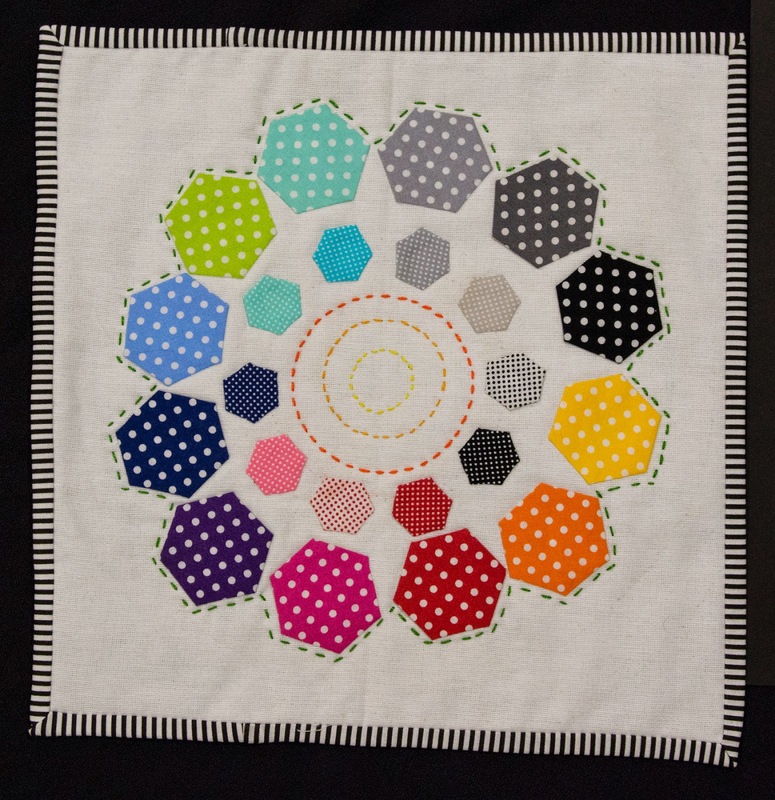 Évi finds the colors in modern quilting quite fascinating, just as the re-drawing of traditional blocks, their transformation, infinite variety, and above all, their geometric design and quilting. She has made a lot of friends through modern quilting; enthusiasts who share her way of thinking, even though they live on another continent. Évi is grateful to be able to present her work to us and thanks the OKCMQG for sharing our quilts with them in Budapest and for opening new horizons in the wonderful world of quilting. As a grownup, Marika followed whatever crafting trend was in vogue: embroidery, cross-stitch, or rug hooking. For a while, she had to give up crafting altogether as there was simply no time with full employment and three children in the house. As Marika's retirement neared, she started looking for a new hobby, although she now has six grandchildren who also require a lot of love and attention. Katalin lives in Balatonszárszó in the Summer and Budapest in the Winter. Her grandmother was a seamstress and Katalin practically grew up under her old Singer sewing machine. Katalin thinks she could work that old mechanical machine long before she learned how to read and write. Her grandmother was sewing for her clients, while Katalin used the scraps on the floor to stitch up dresses for her dolls. These roots led Katalin directly to the apparel industry where she first became a technician and then graduated from college with a degree in apparel engineering and design. Katalin's first patchwork projects were quilts for her baby son, some crawling mats and appliquéd curtains for his room. All this, while never hearing about quilting as an independent craft! Thanks to her mom, Katalin first read about quilting in Anna Dolányi's "Blue Book". She systematically went from page to page and made all the blocks in the book. She was completely hooked by the time she finished the book! With the dawn of the Internet, Katalin started collecting pictures of projects she liked. Her "Bucket List" folder is HUGE! Katalin has two old DDF machines; one is an industrial Textima 8332, the other is an old Neumann home sewing machine. Her family is really supportive of her quilting hobby. Her husband is a woodworker/carpenter and every time she finishes a wall-hanging, he goes and makes a frame for it and hangs it on the wall! Her son also has the sewing "bug" and Katalin helps him make bike courier bags to order. Enikő's life took a turn in March of 2010, when she went to a quilt exhibition. "This is what I really want to do", she told herself. She was mesmerized by the colors, the patterns, and all the possibilities offered by the fabrics. She finds it incredibly fulfilling when the quilt she makes someone out of small pieces of fabric brings them joy. Sewing for Enikő has always signified making something useful and heartwarming out of "nothing". THANK YOU to all of our new modern quilting friends in Budapest and congratulations on establishing the first Modern Quilt Guild in Budapest! Your stories have touched our hearts and your works have truly inspired us. We look forward to more opportunities to learn from and get to know each other as we try to make the world a more beautiful place.